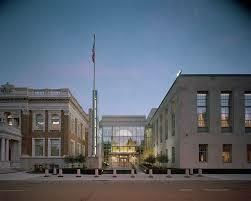 Erie’s Federal Courthouse Complex is comprised of multiple buildings within the historic heart of the downtown area. Since its inception, Erie has used multiple buildings as federal government offices, the first being the Old Custom House at 409-413 State Street. Originally a branch office of the United States Bank of Pennsylvania, the Custom House was purchased by the government on July 2, 1849. This stately Greek Revival style structure was built in 1839, and was used by the government as a Post Office and as a Customs House for the port of Erie. It was later used by the Strong Vincent Post of the Grand Army of the Republic and Historical Society of Erie County. It is now owned by the Erie Art Museum and being used as storage and gallery space. By 1870, the government was searching for a larger building that could accommodate more federal offices. Supervising architect of the Treasury Department, Alfred B. Mullet, presented the need for a new structure for Erie’s – and the United States’ – growing government staff. In June 1878, a request was sent to the House of Representatives by U.S. Representative Herman Humphrey, and the request was approved June 27, 1882. A $100,000 appropriation for the erection of a federal building was granted, and construction commenced on the site of the former Rufus Reed Mansion, located on South Park Row, in April 1885. This would place it near Erie’s major hotels, convenient for out of town shippers, merchants, and others doing business at the federal building. Built by Buffalo architects Straub and Schmidt, and stone work completed by local Henry Shenk, the project was completed in Fall 1888. Inspired by Second Empire architecture with hints of classical, Gothic, and Romanesque design, this eclectic building would house federal offices for a half of a century. As Erie continued to expand, a new federal building was commissioned in the midst of the Great Depression. To stimulate Erie’s building industry and to provide more office space for the federal government, an Art Deco courthouse was built in the place of the Second Empire federal building that was completed in 1888. During the Great Depression, it was not uncommon to see Art Deco or Modern style structures being erected on sites of former federal buildings. Construction projects were used to stimulate the economy and provide jobs to the ever-growing unemployed population. Funded by President Roosevelt’s New Deal, specifically through the Works Progress Administration, a sleek Moderne three-story building constructed of limestone was completed in 1938. Constructed by Detroit contractor, Henry Dattner, subcontracted by Jerry Quirk, and designed by Cleveland architect, Rudolph Stanley-Brown, this building was a symbol of revitalization and hope, and a look into the modern age. Behind the site of the new federal building was Issac Baker & Sons Clothing Store, or simply, the Baker Building. First established in 1860 by Bernhard Baker, a German immigrant, the company was carried into the next century by his son, Isaac Baker. Their main building sat at 629-631 State Street, which opened in 1910. In December 1943, a fire destroyed the entire structure. Construction of a new building began in 1944, which was halted by the demands of World War Two. General contractor, Henry Shenk, and architect, Walter T. Monahan, both of Erie, as well as architect George Meyer of Cleveland, led the project, which commenced in May 1945. The new Art Deco building stood out amongst the surrounding traditional structures. Unfortunately, Issac Baker & Son, then owned by Sam Sherman, closed in the 1990s. Just east of the federal building and Issac Baker & Son is the historic Erie Public Library, which was built in 1897 on the corner of French Street and South Park Row. Slowly deteriorating after the construction of the Raymond M. Blasco, M.D. Memorial Library on Erie’s Bayfront, the Erie School District, who owned the property, needed to sell the vacant structure. At the same time, Sam Sherman was looking to sell his building, and the federal government was lacking office space. By 1988, court officials presented Erie’s need to expand to The U.S. General Services Administration (GSA), who then developed several plans to redesign Erie’s federal offices. An annex was to be built that would connect the Erie Public Library, federal building, and the Baker Building, preserving Erie’s history while providing more space for federal officials. A model of the expansive Federal Courthouse Complex was unveiled on March 9, 1998, a decade after court officials’ initial complaint. Architecture firms Kingsland Scott Bauer Associates and Dan Peter Kopple & Associates led the project. Glass was the main element of design, allowing the library to seamlessly connect to the court house, which would then connect to the Baker Building through a five- story annex. The project was allocated $33 million through President Bush’s Treasury and Government Appropriation Act of 2002, allowing construction to begin on April 22, 2002, which was led by Mascaro Construction Co., of Pittsburgh. The Erie Public Library building was fully restored, and now houses Bankruptcy Court and court official offices. The ornate atrium and rotunda appears as it did in 1897, and the exterior of the structure was repaired to its original appearance. A modern glass annex connects the library to the original courthouse, allowing natural light to flood the space. The annex includes a courtroom and an office space that can be converted into another courtroom. Limestone and buff- colored brick support the glass walls that climb five-stories high. The original courthouse contains multiple federal offices, which connects to the Baker Building, now home to a local branch of the U.S. Postal Service. Completed in August 2004, the Federal Courthouse Complex connects and reuses three historic properties. Blending the old and the new, modern glass walls do not undermine the architecture of these historic structures. It continues to serve Erie as a center for justice, while paying homage to the city’s civic history. Sources: Paletella, Ed. Establishing a Presence: A History of the Federal Courthouse Complex in Erie, Pennsylvania. Erie, PA: Erie County Historical Society, 2004.